Life can be challenging and we wear the remnants of those challenges on our face in the form of "crow's feet", sagging skin and other facial issues. A face lift may be the answer for some but these require significant downtime and are rather expensive.. According to this Toronto-area provider, a facelift can cost up to $15,000 and may require general anesthetic, an overnight stay in an aftercare facility, as well as a couple weeks of home care, and yet the effects may last less than five years. For those who feel a full facelift isn't the answer for their life situation, Envision Medical Spa has another option that is minimally invasive, requires no overnight aftercare and is a fraction of the cost of a surgical face lift with results which can rival the pricier option. It's called Soft Lift. BotoxCosmetic - This long-trusted product helps to relax small face muscles which cause facial lining. Botox has been used to treat a number of medical issues since 1985 and received approval for cosmetic use in 2001 from Health Canada. Juvederm - Amazingly, Juvederm has been around since the 1930's. It is made of hyaluronic acid which combines with natural skin moisture to "plump up" lines and provide fullness where mass may have been lost over time. When used together, in the treatment known as Soft Lift, the combination of muscle relaxation and filler provides a result that enhances youthfulness better than either product can do on its own. This dual-action treatment creates a result comparable to a full surgical face lift. 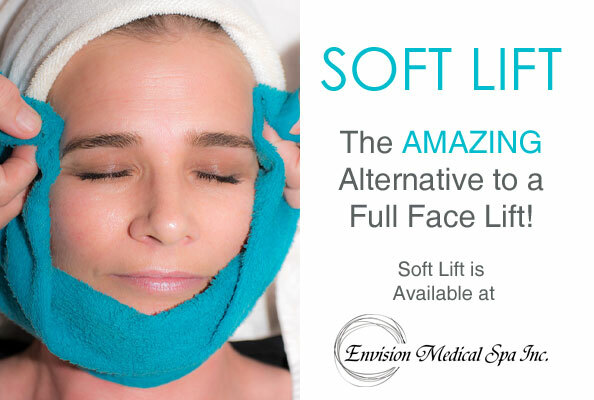 Another great aspect of a Soft Lift treatment is the combination of relaxer and filler can be customized to your unique facial profile. You will have to get touch up treatments of the Botox, usually three or four times a year while the Juvederm may need refreshing after 12 to 18 months. The first treatment often has the shortest duration while subsequent treatments which don't start with a "blank canvas" tend to last much longer. Full face lifts may last over five years but a "mini face lift", also known as an "S-Lift" (named for the shape of the incision near the ear) usually only lasts for a couple years on average. When comparing these treatments, it's vital to keep in mind as far as reported satisfaction with the result, the RealSelf website's respondents rate both procedures as "worth it" over 90% of the time. How do I know if Soft Lift is right for me? We are all unique human beings with individual needs, issues, concerns and resources. The best way to get the face you wish to recapture is to talk to one of our clinicians. Don't forget at Envision, your first consultation is free.